At this point in time, YQ may well be one of the most exotic martial arts around. To some, the mystery derives from the unusual convergence of standing practice and fighting methods. C S Tang has taken on the task of making the mystical understandable. We recently talked to Sifu Tang (see interview) and found that this book is the result of years of training, an official position with the HK YQ association and a library of personal YQ film documenting many masters of this art. Jan Diepersloot is an Yi Quan practitioner who has studied under Fong Ha, Han Xing Yuan, Yu Pen Xi, Cai Song Fang and Sam Tam. This first volume in his two book series is devoted to standing practice and the four basic actions of Peng (Ward Off), Lu (Rollback), Ji (Press) and An (Suppress). The author's emphasis is on practice of Standing postures supplemented by Push Hands style exercises. With unusual graphix (to say the least) he goes into a lot of information on the nature and practice of the meditative aspects found in martial arts. 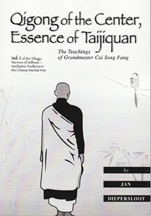 The foundation for this first volume is Yang Tai Chi. He talks about the postures themselves with a very thorough set of details. He not only concentrates on health benefits but the Issuing of Power and the general principles of body alignment and spine integrity. Many details on this practice. A well known book. "The Method of Awareness in the Martial Arts"
Jan Diepersloot is an Yi Quan practitioner who has studied under Fong Ha, Han Xing Yuan, Yu Pen Xi, Cai Song Fang and Sam Tam. This second volume, written five years after the first, takes us into the world of Yi Quan (also known as Da Cheng Quan). This style based in Xing Yi with attributes from Ba Gua (the walking) and Tai Chi (the issuing) is meant to be a radical "condensation" of the salient aspects of Chinese Martial Arts. In keeping with this philosophy there are not forms to speak of but a strong emphasis on standing practice. 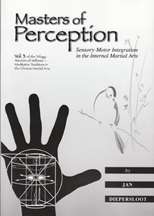 This book goes through this along with some Shi Li (testing) practice in great detail. There are also walking and partner exercises. Diepersloot is a believer - though there has been some controversy about claims in this style. In one section he brings up the problematic issue of KONG QI or "empty Chi" which is the ability to transmit Chi through without contact. He sites the well known Bay area teacher Mr. Yu who taught and impressed many teacher of Kung Fu in this area by moving people without touch (excepting, of course, Anthony Chan). Some say it is the gullibility of the practitioners (not an impossible explanation) and some say it is the real deal. 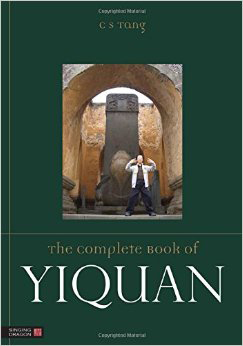 This is one of the first books ever written on Yi Quan in English and should be on the shelf of those interested in the subject. It has a straight forward and dedicated voice whether or not you buy every idea. 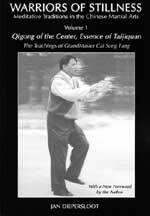 Jan D’s books on Yi Quan, standing meditation and the entire theme of internal training are, when taken as a whole, a story of a quest. Confronted with a way of thinking alien not only to Westerners but, more and more, to anyone— even Chinese— living in the space-frame of the modern world JD decided to avoid two common traps in dealing with this new and exotic body of information: he did not become an China-clone repeating standard theology without the benefit of being raised in the culture and he did not chose the superficial explanations that believe just about anything and cloak it in pseudo-science. This is the third book in a work that has taken years. This volume records a new level of challenge and information. While he struggles with this JD he brings up his views and speculations on many aspects of standing practice. He discusses, and often with new insight, the different views of balance, the true idea of central equilibrium, the need for sphericity, issuing energy, and benefits to health. As the book progresses JD even delves into the nature of transcendence in the martial artist’s life. 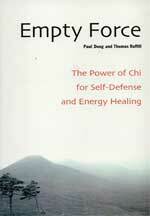 If you have any interest in empty energy, standing practice, qi movement and the such you should read JD’s books. He brings to the discussion the kind of openness with his own experiments and feelings, and theories bolstered by a lifetime of reading and thinking, that make a discussion possible. For teachers and advanced students there will be many ideas here, even uncomfortable ones which can, sometimes, be the best kind. When I first stumbled on this text I was unaware of Yi Quan. Therefore my reaction to the book was without concern for its martial origins and applications. I was taken with the comments on its relation to my own first Taiji style, Yang Shi, and the use of the WuJiShi practice by my Great-Grandteacher, Yang Chen Fu. Cai supports this by claiming the WuJiShi was passed down from Yang to Ye De Mi then Jin Ren Lin and then to himself. Cai is responsible for bringing this method to the South and the Guangzhou area. Though quite tehnical in parts, this is a small gem of inspirational teaching: solid, foundational Qigong in a world suddenly hustling faddish and questionble techniques. Whether you subscribe to the Yi Quan general theory or not, this is a fine source of information. "Empty Force, or Ling Kong Jing, is an extraordinary technique that harnesses the power of chi (the body's vital energy), enabling masters of the art to defend themselves against opponents and heal themselves and others without physical contact. Through the practice of this method, one gains mastery of the mind and spirit and gives rise to a physical force that can affect others—a powerful maifestation of the achievement of harmony wth nature. " We strongly recommend this book for anyone interested in the core of Kung Fu (WuShu) training. This doesn't necessarily mean we agree with everything in the book but it is worth a read. This book in about the style known as Da Cheng Quan (later as Yi Quan) developed in the 20th century by Wang Xiang Zhai. One of the purposes of Da Cheng Quan was to modernize and simplify WuShu training. Wang was very out spoken and critical and so is the author Wang Xuan Jie. Not only does this book outline the seven methods of practicing DCQ but it has a number of really thought-provoking essays critical of WuShu training. If you think it's only recently people have criticized forms, shadow boxing, too many techniques , etc. then you are mistaken. This book talks about the instructor-student relationship, doing and learning, combat skills and more. While not some claims of Da Cheng Quan's practitioners may be exaggerated and misleading, there are many things in this translation to think about. Methods of fighting and practicing are also outlined. Read about the break from the classical before the JKD thing was even a germ of an idea. This rare edition in hardback comes complete with dust jacket. Limited supply! This little volume (around 5 1/4 X 7 1/4) is the "other" book in English by Wang Xuan Jie, and much more difficult to find. Wang is the "youngest" and favored disciple of Wang Xiang Zhai: the creator of Da Cheng or Great Achievement boxing. Wang Xiang Zhai, was himself a student of the famous Xing Yi boxer, Guo Yun Shen. He definitely had a mission in life. He wanted to revivify Chinese martial arts which had taken many blows to the ego from Japanese and Western opponents. He cut right to the core of the problem by criticizing many "outmoded" training methods, especially the practice of forms. He also wrote a number of scathing editorials critiquing numerous aspects of WuShu. He tried to simplify the art but keep the Chinese character with its strong emphasis on internal training. Da Cheng was developed which later became Yi Quan, a very popular style at the moment. There is a bit of concern in the Wu Shu community that the many victories claimed by the Da Cheng group are somewhat exaggerated since there are said to be records of open matches with Da Cheng teachers losing in, for instance, Shang Hai. (We're hinting at research projects here more than criticizing styles. Anyone who doesn't known about the exaggeration rampant in Chinese martial arts is, indeed, new to the scene.) Be that as it may, many of the DaCheng criticisms are well-founded and interesting. If you think forms, set techniques, and many other aspects of Chinese martial arts have never come under the critical light that people like Bruce Lee shone, you don't know the history of the art. This book is illustrated not by line drawings but photographs of Wang himself demonstrating the methods of practice for the art. Wang was designated by the Founder to be capable of passing on this art.